Siri, the intelligent virtual assistant that is currently exclusive to iPhone 4S, has been effectively ported to iPhone 4 and iPod touch. More importantly, it actually works this time around and there are two videos demonstrating the two devices taking voice commands and Siri reporting back. … It does require files from an iPhone 4S which aren’t ours to distribute, and it also requires a validation token from the iPhone 4S that has to be pulled live from a jailbroken iPhone 4S, and it’s about a 20-step process right now. This suggests the mod will be limited to individuals who own an iPhone 4S in addition to other compatible hardware, making them responsible for copying their own Siri files over. Regardless, that is likely against Apple’s EULA with iOS and Siri, but the importance of the port functioning is the proof that Siri does work on older iOS hardware, although some devices run into complications. 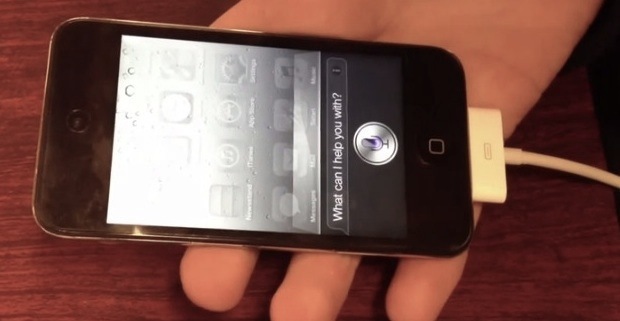 On the iPhone 4, Siri appears to be working fine and with the same fluidity as that seen on the iPhone 4S, but apparently the iPod touch’s microphone isn’t as sharp as the iPhone models, forcing the user to speak slower and louder for Siri to pick up voice commands. The latter example could also impact the iPad 2, which has seen the port too, and this could be why Apple did not release Siri to other hardware with iOS 5. If a legitimate walkthrough comes available, we’ll be sure to look into it. The other side to this news is the evidence of an impending jailbreak for iPhone 4S and iPad 2, or else the port wouldn’t be possible. There is no ETA on that release however. Since it works well on the iPhone 4, the likely motivation for not including it in the iOS 5 update is a slight motivation for people to upgrade from the 4, and to convince people to select the minor speed bumped 4s over the essentially same but price discounted 4.